Techlink 680211 1m TOSLink Optical Cable. Synthetic fibre and extremly effective cladding ensure optimum light transmission and the highest quality sound. Uses the finest fibre technology available to ensure low jitter and the least signal loss. 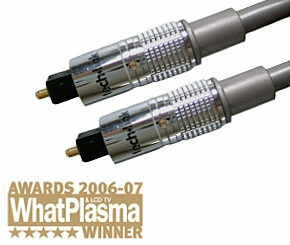 Chrome plated toslink plugs with laser etching. The Techlink 680211 digital optical cable features standardised Toslink connectors and high purity optical cables using the finest technology available to ensure low jitter and the least signal loss. A carefully engineered synthetic fibre and cladding ensures optimum light transmission and the highest quality sound. This lead is for the digital transmission of the signal between amplifiers, DVD player/recorders, Blu Ray DVD, Sky HD, Sky+, Virgin Media etc. Techlink 680183 3m Scart Cable, Round Cable Scart Lead with OFC Cable and Gold Plated Contacts. High-end performance at an unbelievable price. Double shielded non-migratory Oxygen Free Copper conductors throughout. 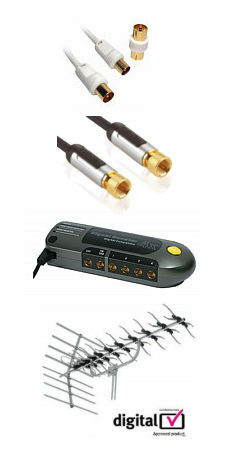 Individual Al-Mylar Aluminium foil shielded signal cables for improved picture and sound-to-cable signal migration. Flexible PVC outer jacket to bend and fit into the tightest of spaces. Laser etched chrome plated metal scart connectors. 2m White 3.5mm Jack Cable Straight to Angled Straight to 90 degree right angle 3.5mm connector both ends Stereo audio jack plug to stereo jack plug. Gold plated connectors. Colour white Length 2 metres Ideal for connecting audio devices to aux in connections Suitable for use with phones, tablets, laptops, PCs, ipods, portable audio devices and any other device with a 3.5mm audio output.